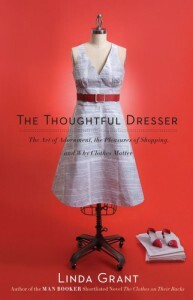 So I didn't bother to look up any background on this because by the time I finished the book (forced myself to blitz through the last 40% tonight in one shot to get off my Currently Reading list) but I gather from context that the author, Linda Grant, started a fashion style blog some years ago and this book was later spawned. It seems like she just expanded on some blog posts; sometimes she directly cites posts and comments from her blog. -- "The purpose of this book is to advance no theses, to break no ground in the history or theory of fashion, but rather to explore what is already known but rarely thought about by the ordinary mass of humanity who is interested in fashion and might, quite wrongly, feel a little ashamed of this passion. Might fear that they are not going to be taken seriously. That in announcing this preoccupation they will have confessed that women are not really fully grown up; unlike our male counterparts, who have mature and adult preoccupations without which the human race could not survive, such as moving balls from one end of a grassy field to the other with the aid of the human foot." Splendid, I thought. Sarcastic, too, even better! I regret the credit I wasted on Scribd for this book now. I accept that the author claimed there was no defining stance on the topic, and given that the topic is fashion, can there really be any firm ground to stand on at all? Yet that is exactly what she tries to do! Ping ponging from how clothing and adornment was a vital part of reestablishing self-identity to Holocaust survivors (agreed) to slamming women who dress unsuitably based on how the people around them (read: the author) react to promoting feminism in the form of being able to wear whatever a woman feels empowered wearing back to deifying the mythical standard of Old Hollywood Glamour which no one is able to achieve in the modern day because the author hasn't been able to, end discussion. The part that irritates me about this flip flopping, which okay, perfectly reasonable to spend 250+ pages rambling about to a paying public if we're sucker enough to buy it, is that her writing voice comes across as so darn condescending and prejudiced. If I could throw this book across the room, I would. Alas, e-books and the fragility of my electronic devices. Not to say I didn't find the book entirely devoid of enjoyment. If you can speed read through it, then the sharply written bits are quite funny and you can brush off the rest. The hard part was forcing myself to keep coming back to it to read more after being interrupted.